A few weeks ago I went with Michael to pick up a package of bees near Winfield. One of my hives had died out after an unexpected snowstorm in March. They were my favorite hive–Carniolan bees, gentler than the Minnesota hygienic Italian bees I usually raise. It was a dreary day with heavy skies and the fields were newly planted with little growth amid the standing water on the Missouri River flood plains. I was not in the best frame of mind and wished I could have put the whole trip off but the bees could only stay in their temporary package so long before they would die off. 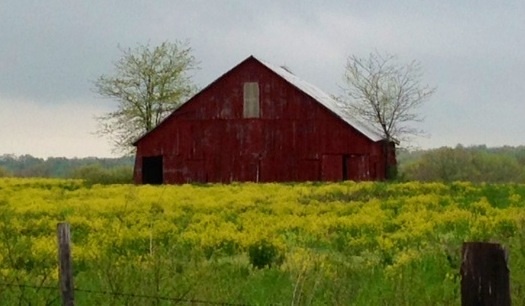 As we rounded the bend, I saw it–a weathered red barn in a field of yellow wildflowers. How could I give in to the gloomy day with this reminder that the world was a good and beautiful place? A few weeks later I was on the radio talking about a new youth summer jobs program the foundation had initiated. These programs are common in other large cities but there was currently no organized widespread effort in our community. It had been a long haul. We had had some success and two hundred young people would have jobs. Donors had come forward from the business and philanthropic sectors and we had garnered support from the local government as well. It had not, however, been easy. The foundation’s motivation was grounded in social justice. The rationale for business’s support related to workforce development and economic growth. The governmental involvement meant balancing political realities. Fundamentally, everyone wanted the project to succeed, but the behind-the-scenes work to develop the actual program, create realistic expectations and manage relationships took an inordinate amount of time and energy. Being on the radio was a piece of cake compared to all of that. I was tired. After the radio show a friend texted me and said she had heard the radio program and it was great. And then a colleague sent me an e-mail in which she acknowledged that it must have been tough navigating all of the relationships to bring the program to fruition but that it was worth it; she thanked me. A red barn in a field of yellow flowers.